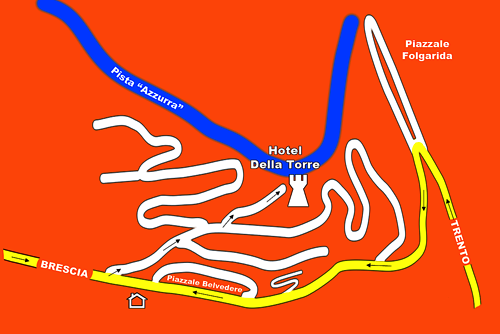 Hotel Della Torre Folgarida - How to reach us! After the towns of Mezzolombardo, Cles and Malè, once you reach the small town of Dimaro, turn left towards Folgarida - Madonna di Campiglio. You’ll arrive at the hotel 7 km after the crossroad. With “Trenitalia” you can reach the station of Trento from where you go to the local railroad “Trento - Malè” that, after an impressive ride of about one hour with the direct train and one hour and a half with the local train, arrives at the station of Malè or Dimaro. From there, you can take a Bus that in just a few minutes brings you to Folgarida.